Everyone likes smoothies, right? What’s not to love when you combine creamy yogurt, fresh or frozen fruit, natural sweeteners, plus delicious and nutritious superfoods? If you have kids you know that they can come up with any number of reasons not to like something. Start with ingredients kids love. Introduce kids to smoothies by giving them what they want: tasty ingredients. Focus on the healthy ingredients they like initially and then slowly bring in the ones that are more controversial. You know your kids and what they like, but typical kids want sweet ingredients and a creamy, milkshake-like consistency. Use yogurt to get that creaminess and use plenty of sweet fruits like berries, ripe peaches, bananas, pineapple, and grapes. Chocolate is also a big hit with most kids, so try using small amounts of raw cacao with a little natural sweetener to make a smoothie more enticing. Get the kids involved. Another great way to get your kids more excited about smoothies is to get them involved in the process of making them. 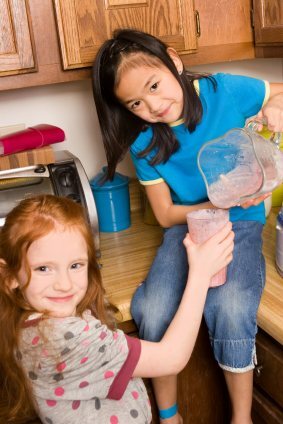 Let them help you make the smoothies with the ingredients they like and work up to letting them make ingredient suggestions and craft their own recipes. There may be some mistakes along the way, and some unpalatable smoothies, but ultimately they will be more engaged with their food and more interested in what they eat. Most importantly, they will be having fun with you in the kitchen. Try smoothie pops. Your kids will never be happier to be involved with making their own food when it means making popsicles. All you need is a set of Popsicle molds. Make their favorite smoothie, poor it into the mold, put it in the freezer and enjoy. A smoothie pop is an excellent treat for hot summer days and definitely beats the sugary, chemical-laden treats you’ll find in the grocery store freezer. Hide their greens. If you have a kid who likes to eat vegetables, count yourself lucky. Even the most veggie-loving kids may still have a hard time facing things like broccoli, spinach, and kale. The health benefits of green, leafy vegetables are numerous, but it may be a chore to get them into your kids’ diets. Smoothies are a great place to hide those nutritious greens. Most greens can be masked by other potent flavors, especially fresh fruits which kids love. Use baby greens, like baby kale or baby spinach, which have a milder, less bitter flavor. Don’t forget the healthy fats. Kids will enjoy a rich, creamy smoothie and there are plenty of healthy fat sources you can use to make one. Natural nut butters are a great choice. Look for organic peanut, cashew, and almond butters without added sugar. These go particularly well with bananas and chocolate. Avocado is another great choice for healthy fats and a creamy texture. Believe it or not you can add avocado to nearly any smoothie recipe without changing the flavor. It adds creaminess and nutrition. Just because certain ingredients are nutritional powerhouses for you does not mean they are necessarily great for your kids. Most healthy foods are fine, but there are a few superfoods that you should avoid or limit in making kid-friendly smoothies. Cacao, for instance, contains stimulant compounds which can be harmful in large quantities. Avoid cacao altogether for very young children and toddlers. Use small amounts for your older children. You can substitute carob if you are concerned about using cacao. Another superfood to be cautious with is maca. This medicinal root has long been used as a supplement to improve sexual function and libido, which means that it affects hormones. Evidence as to whether it is safe for children is limited, so avoid using this with very small children. Giving small amounts to older children is probably fine. Spirulina, which is a blue-green algae packed with protein, vitamins, minerals, and antioxidants, is a great smoothie supplement for adults. The safety of spirulina in children is largely untested. As with maca, giving small amounts to older children is probably fine. Honey is a great natural sweetener for smoothies and is fine for kids over 12 months of age. Infants under one year may be at risk for developing a botulism infection from honey. The spores of the bacteria that cause botulism are sometimes found in honey. Young infants can’t defend against them, but older babies, kids, and adults can. Any kind of product with honey in it should be avoided in infants. Liquid. Use between one and two cups of liquid for your smoothie and always add it to the blender first. Common liquids for smoothies are milk or milk-substitutes, fruit juice (watch the sugar content), tea, water, or coconut water. Texture. To get a creamy consistency you need a texture element. Many recipes use banana for texture, but you can also use avocado, nut butters, yogurt, ice, or frozen fruit. Fruits and vegetables. For flavor and nutrition you need fruits and vegetables. One to two cups is the right amount. Add-ons. Small amounts of additional ingredients can be added to smoothies for flavor, for a nutritional boost, or for both. You can use a sweetener (honey, maple syrup, stevia) to enhance the flavor or add a dose of a supplemental superfood. Even a dash of high quality sea salt can improve the taste of your smoothie and add minerals. Click here for info on why salt should be added to most of your smoothies. Experimenting with smoothies recipes, once you have the basics down, can be fun for both you and your kids. If you’re not feeling adventurous right away, practice first with some tested kid-friendly recipes. From there you can create your own. Strawberry banana: It’s hard to beat the combination of two sweet and tasty fruits. No kid will say no to a strawberry banana concoction and this recipe is good for a first smoothie. It will introduce your kids to how great smoothies can be. For a big batch of strawberry banana smoothie start with a cup of milk. Add one cup of frozen strawberries and one banana. Throw in just a quarter cup of baby spinach or kale. Mango: If your kids have a sweet tooth, fresh mango makes a great smoothie that is naturally sweet. Start with a cup of water or milk. Add a half cup of Greek yogurt, the fruit from one fresh mango and enough ice cubes to give you the right consistency and the desired temperature. Include one carrot, which will blend into the color of the mango and is also sweet and full of vitamin A. Chocolate peanut butter: If you have a kid who loves chocolate try this simple recipe. Start with a natural, preferably organic, peanut butter. When the kids are feeling more adventurous, substitute peanut butter with almond, cashew, or any other type of nut butter. Start with a cup of almond milk in the blender. Add one banana, one tablespoon of raw cacao powder, and two tablespoons of peanut butter. You can also add a little sweetener, such as a tablespoon of honey, if your kids are used to having sweet foods. You can reduce the amount of sweetener you use over time. Green smoothie: When you think your kids are ready for a full on green smoothie, here’s a good basic recipe to try. Start with a cup of water and add one cup of fresh baby spinach or kale leaves, a half a banana and one and a half cups of a sweet fruit of your choice. Pineapple, mango, green grapes, apple, or any combination of these fruits work well. If your kids like a creamy smoothie, also add one half of an avocado. Smoothies are not just for adults. Get your kids hooked on a healthy diet by using smoothies. Start with basic, kid-friendly recipes, get the kids involved in making them, and experiment and you’ll soon find that they want a smoothie for all their snacks. Additional input on kid friendly smoothies is both welcomed and encouraged in the comments below. Happy Blending! This is so informational and helpful. We all know it can be difficult to get kids to try anything that remotely looks too healthy. I had a good chuckle “eyeing your concoction with suspicion” is the exact description my girls give me when they see spinach or kale being washed in the sink. Thank you for the idea of making smoothie pops. I am going to make those tonight in order to get rid of those popsicles that are currently in my freezer full of high fructose corn syrup. Keep up the great work! Thanks for stopping by. Nice to hear you found this helpful. My mom could have used this info because I was one of the pickiest eaters ever as a kid :) Thankfully that changed. I’m pretty confident your kids will love the smoothie popsicles. Did I read correctly that you are in Michigan? I sure am. From Grand Rapids, currently living in Brighton. Are you in Michigan too? Howdy, neighbor. I am in Novi.